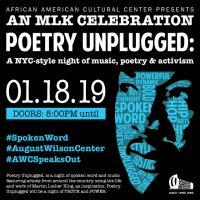 The third annual Poetry Unplugged is a night of spoken word and music featuring artists from around the country using the life and work of Martin Luther King as inspiration. Poetry Unplugged will be a night of TRUTH and POWER. Mahogany Browne hosts an evening filled with Award-winning spoken word artists known for their fierce delivery and ability to move the crowd. Featured poets include Jessica Care More, Prentice Powell, and many more.